The novel is published by Lake Union and is available as an ebook, paperback and audio through Amazon. Now a bestseller in France and Russia/Ukraine, the novel has proved popular in Italy, Norway and Bulgaria too. 1905 INDIA. 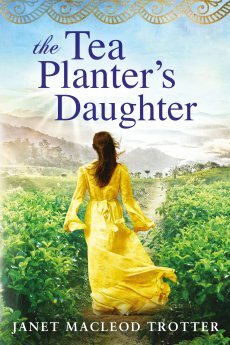 Clarissa Belhaven and her younger sister Olive live a charmed and carefree life on their father's thriving plantation. But when the business begins to fail, their happiness is threatened. Wesley Robson, a brash young rival businessman, offers to help save the plantation in exchange for beautiful Clarrie's hand in marriage, but her father flatly refuses. And when Mr Belhaven dies suddenly, his daughters are forced to return to their father's family in Tyneside. In Newcastle, Clarrie is shocked by the dire poverty she witnesses, and dreams of opening her own tea room, which could be a safe haven for the locals. But her idea is dismissed as hair-brained by her family and, in order to provide for herself and Olive, she takes a job as housekeeper for kindly lawyer Herbert Stock. With Herbert's support, Clarrie finds she can achieve her dream, and she opens her own tea house. But Herbert's vindictive son Bertie, jealous of Clarrie's popularity, is determined to bring about her downfall. The character of Clarrie Belhaven leaps off the page as a truly believable heroine who inspired sympathy. Not normally given to e-mail authors but must tell you what a fantastic story. I thought I had done with romantic/historical fiction, you have changed my mind. Will there be a follow up?